Getting started with this part of the assignment was quite difficult as it is hard to find good natural forms in Bangkok and did not have time to leave the city for the countryside. 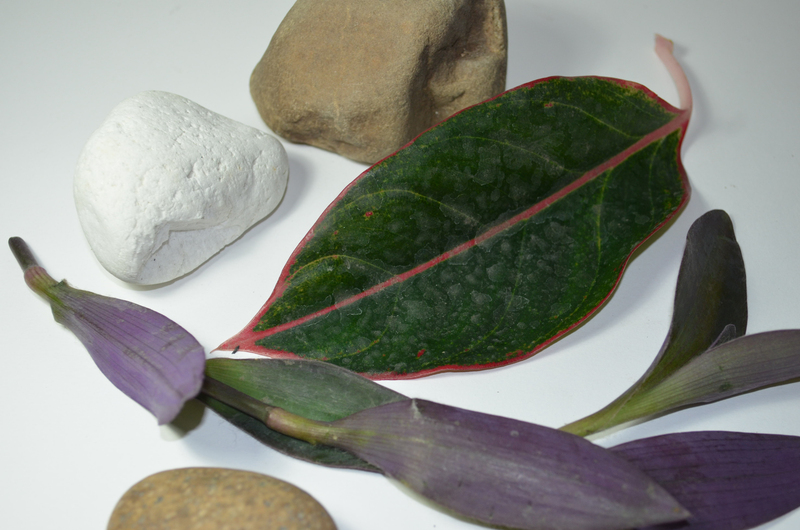 So I collected pebbles from the car park of my apartment and in front of the office block where my language centre is and also went out with a pair of scissors and took a couple of cuttings from plants in the garden downstairs. Overall I was quite happy with the objects I chose. After the very technical composition of the made objects I wanted to show a complete variation with something more simple and the objects I chose allowed me to do so. I originally intended to do the finished drawing in colour pencil but as I began the project things took a different path. 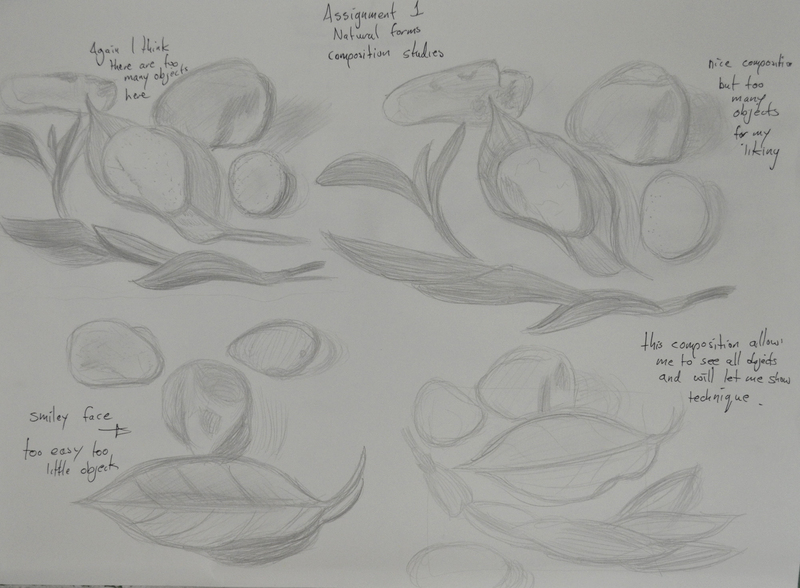 Working on the composition studies it was like a breath of fresh air compared to the composition studies of the made objects so much so that I may have moved a bit too quickly with fast strokes and very sketchy outlines. The leaves the plants that I had brought in to draw were not going to wait for me as they had started to wither as soon as they felt the air-conditioning of my living room, so working quickly was very necessary. I tried a few compositions with three and four pebbles eventually settling for one of the easiest compositions possible and so worked on it a little more and got it ready for enlargement. The next step was to experiment with different mediums to help me decide exactly which one I would be using for the finished piece. By this stage the plants were well on their way to the grave, so I took several shorts with my camera so that they would help me later, unfortunately I did not take a photo of the composition I had chosen this would prove to be a problem later. I actually wanted to try soft pastel but then when I opened the box up I realised I had purchased a portrait set which would be no good for this project.So I tried both colour pencil and hard pastel. I don’t like the feel of colour pencil on paper, they are ok for lighter work but for work that needs more darker tones you have to press on and it makes me feel uptight as the pencil drags across the paper. Hard pastel is different on different types of paper on the Canson sketching paper it can not be smudged but is great for sketching. 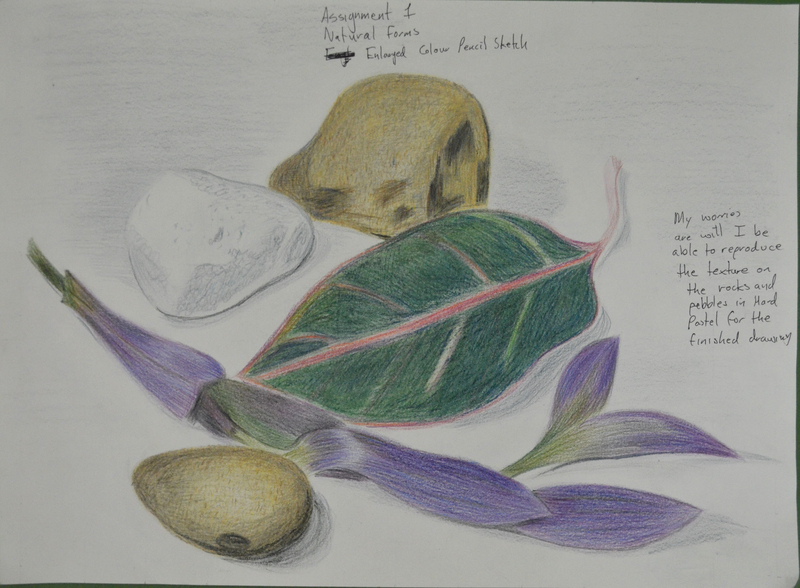 I decided that I would develop the composition in colour pencil and use hard pastel for the finished drawing. 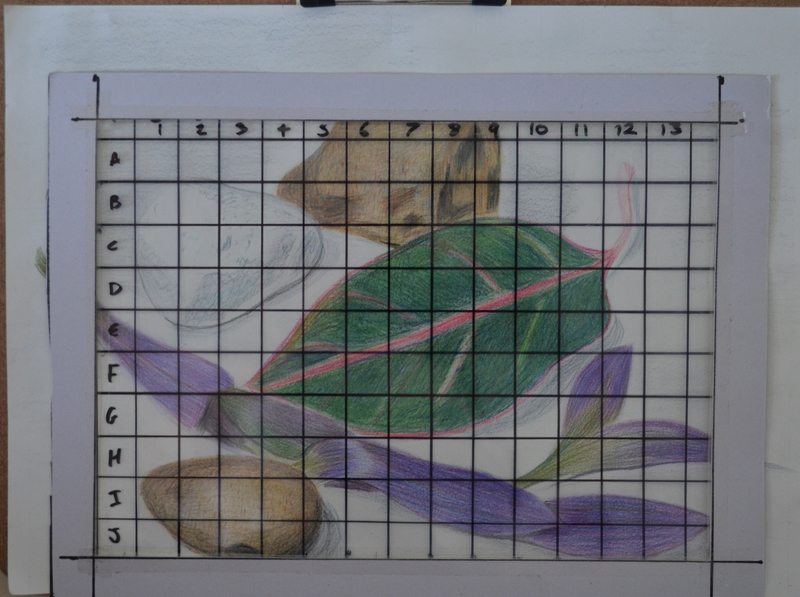 Drawing a grid onto another A3 sheet from my sketchbook I enlarged the drawing and completed it in colour pencil to see how it would look. I was satisfied with how it looked but I wasn’t satisfied with the waste of paper around the edges. There was a very minimum amount of shadow in this composition and so I had to take advantage of the negative space between the objects and cropping the composition would help me to do just that. 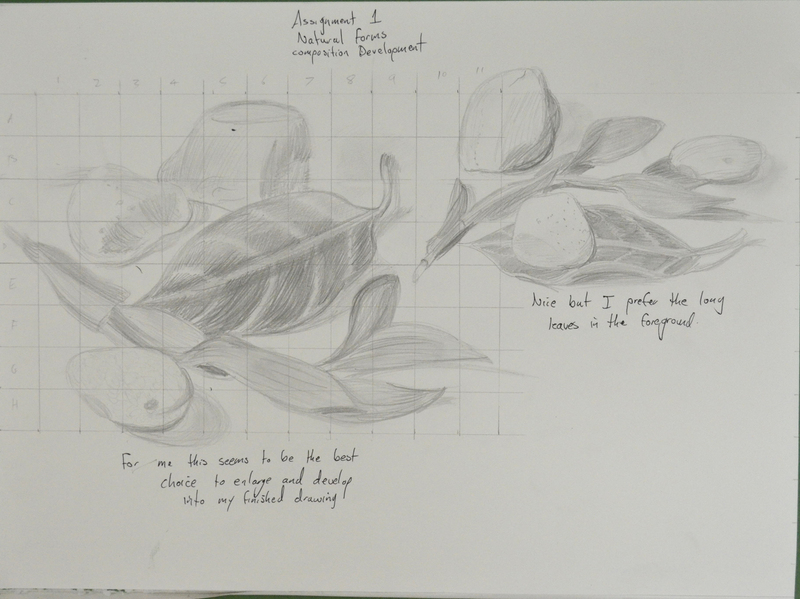 I had already erased the grid I drew when enlarging the previous drawing so it was a great chance to use the acetate grid I made in the Enlarging an Image module. By this time the plants had withered up and I had forgotten to take the photo of this composition so I was working between this drawing in colour pencil and various photos. I was worried that I would just be smudging on this piece especially with my chosen medium and not be able to demonstrate anything I have learnt in the first part of the course but apart from smudging on the rocks and pebbles I managed to resist the temptation of smudging and complete it with some nice hatching and fluid strokes. There are certain parts of the finished drawing that I am not happy with mainly the rock and the pebble in the top left they don’t look two bad but the shape is out on the sandy coloured rock and I couldn’t play with it that much for fear of messing up the leaf and the white pebble which I did and used fixative before going over it again. 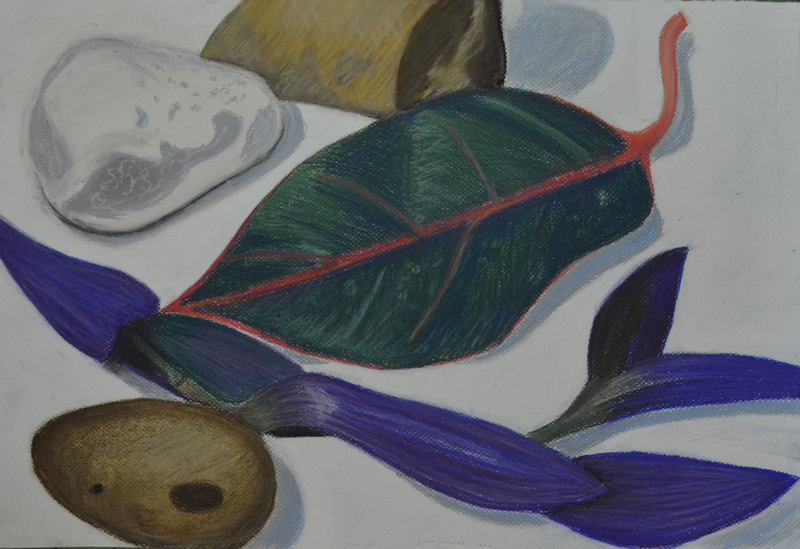 However, I am satisfied that I managed to make reference to certain projects in the first part of the course such as negative space, enlarging an image, tone and form, hatching and lines and other marks and managed to demonstrate quite a lot of these in the leaf and the purple plant alone. 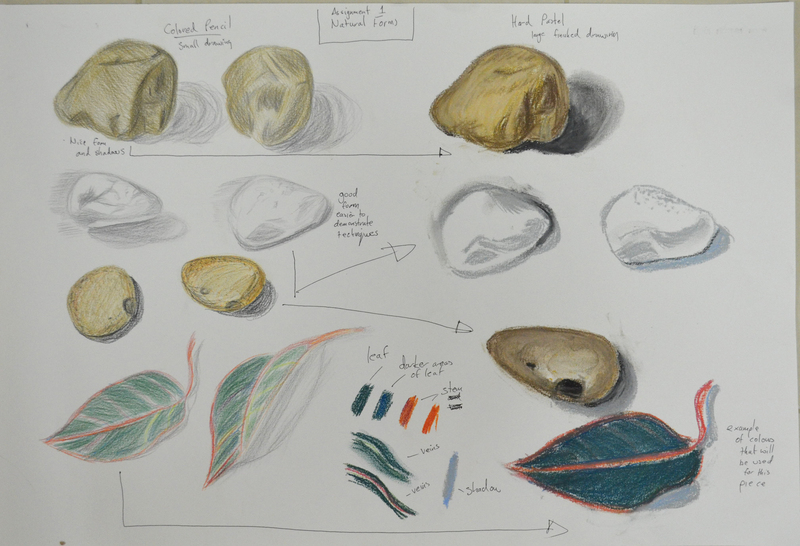 I do wish the rocks would have been more sketchy though but with the pastel paper that I used it was hard to do so without the paper underneath showing through.